I received my package from Forever21 yesterday! [insert loud squeal of glee here.] I ordered these shoes and glasses and am terribly in love with all of it! The shoes are comfortable and wonderfully vintage-inspired, and the glasses... I just feel like the glasses are a perfect way to put on a bit of a disguise. It's fun. So I finally made it to the thrift store to get some new clothes, and came across this fabulous blouse & skirt. The skirt was about ankle length, so this afternoon I shortened and hemmed it, and now I have a totally new outfit! I don't have many yellow garments, either, so this shirt is going to be fun to work with. Eventually, when it gets warm, I'll be able to match it with my favorite yellow shoes! This outfit is very "Librarian Chic," I think. Today was a swell day. I slept in, went to the antique store, walked in the lightly falling snow & bought munchies for cheap. Now we're going to watch a horror movie! Have a good night, darlings. This outfit is adorable! 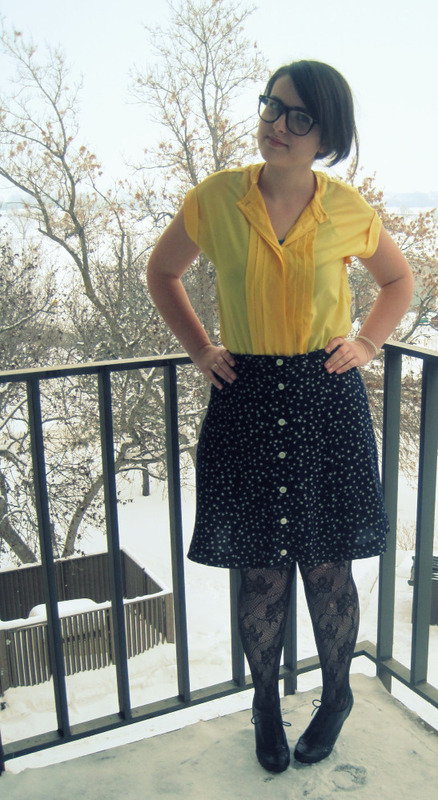 Love the yellow shirt and polkadot combo; good thinking at hemming the skirt, it really look great! New duds! Fun, fun, fun. You look good in yellow. And it makes it seem like spring is a little bit closer. The sun is starting to stream in the kitchen more now. Cute shoes, too, though they do remind me a bit of Auntie Kate. (Wouldn't you agree, Jean?) Love you! Adore the skirt Addie! And with those oxfords you can't go wrong sweety! ohhhh what horror flick are you watching? Shoes. OMG! Shoes. Are they comfy? I hate going into F21, but I saw those shoes on PolyVore and they're freakin adorable. And I love the skirt! It's amazing how sometimes just taking up a long frumpy skirt just makes for the best a-line. I would have to agree the shoes are like what Auntie Kate used to wear. But I love them. The yellow does look fab on you and it does bring hints of spring...which by the way I am dying for. We still don't have a confirmed date on touring the college but we are working on it. I'll let you know. I love the shortened hem of the skirt, and the yellow makes it pop..the shoes are adorable, but I think the polka dots are busy with the tights (which by themselves are FAB!!) and the glasses are CUTE!!! I always dreamed of having lots of different pairs of glasses to wear with different outfits (but since I need them to see they're always $$$) so have fun with yours. you're too dang cute girl!! Oh dear, this is such a late response! I'm sorry! Django et Coco - Thank you so much! & thanks for finding me on Chictopia. 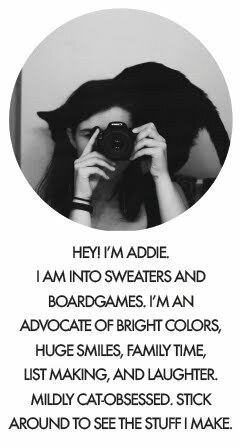 I just joined the site & new friends are so exciting! Heston Folks - Aw, thank you. :) Yes, I think spring might be making a bit of an appearance here, as well. Love you too! Tany - Eee, thanks, doll! Oxfords are my new favorite, I think. Haha, the movie was this awful B flick called "Bloody Mary." We screamed a bunch because we're girls, but it was really a stupid movie. Janice - Let's get some shoes! They are actually pretty comfortable--as comfortable as you can get at 4", I think. & they are surprisingly good quality for F21. And, thank you!! Aunt Jean - Hee, thank you! They are terribly vintage style, but that's just me all over, so I guess it fits. When you're coming, just give me a call... can't wait to see you guys! Jessica - Thanks, darling! You know what, you're right, about the busy-ness. I'm a big fan of CC, & sometimes when you're wearing something it's hard to judge these things, so thanks for the help!! You could always wear contacts + novelty glasses, couldn't you? Give Sefiny a birthday kiss for me!